Don't judge a book by its cover or its size, as the old saying goes. This is one such book. 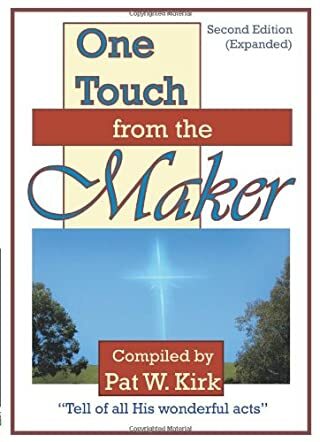 Do not judge until you've read, "One Touch from the Maker". This book is actually many short true testimonies complied by Pat W. Kirk. This is not a story book or even a book of stories, but rather true to life touched by God testimonies that people have shared with Pat Kirk. As you read through the short testimonies, your faith will be made stronger. One can't help to read about how God touched a person or healed a cancer patient and not feel our faith grow and expand. One such testimony is recorded on page 62 from Frank H. Dryer, Jr. He went to the hospital to visit a child who was deaf and dumb. He spoke to the child because he could read lips and, as he prayed an intercessory prayer over the child, the Holy Spirit touched this child in a special way. Encouragement for those who need Him most! Then on page 111, a retired Assembly of God pastor, Leonard Bennett, tells of a drive-by shooting in his daughter's neighborhood. The gang that drove by shot several bullets from a shot gun into their yard. The pastor tells how a bucket, a book, and a screen door stopped them. His son-in-law turned to lay the baby on the sofa just as the bullets came crashing into the screen door. The granddaughter sitting on the porch had bullet holes all around her, making a profile on the outside of the house. Not one bullet touched her but there were bullet holes in her thick book. The grandson playing ton the porch was not hit because an old bucket got in the way of the child. But the son-in-law laying the baby on the sofa was hit 18 times in the chest! If he had not turned just as he did, the baby would have been hit! The son-in-law was rushed to the hospital and survived! But I must mention "The Lure of the Witch." This is a powerful testimony on page 97 by Frances Judge. Prayers avail much! There are many, many such testimonies in this 5 star great-tastic read that I want to "read" to you but just don't have the room! If you need encouragement today, that God is still on His throne and meets the needs of his people, then this is the book for you! I plan to give this book to others for Christmas this year! It would also make a fantastic Get Well Card for someone who may going through a trial or rough time in life. May your faith be increased as you read these wonderful praises of testimony to our Heavenly Father that "tell of all His wonderful acts." Thank you for the kind words. It's an excellent review of my book, One Touch from the Maker, Second Edition.